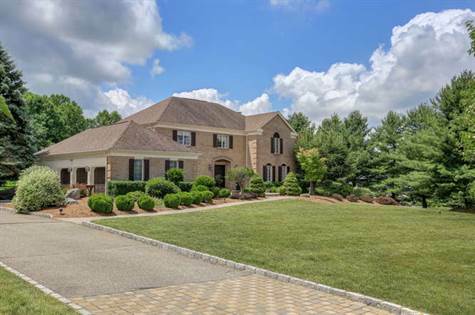 "Fabulous, Elegant, Brick Front Colonial on 3.8 Acres"
Fabulous, Elegant, Brick Front Colonial situated on 3.8 acres, resort level rear grounds, sparkling in-ground heated Pool & Spa, Deck, Patio, every amenity, beautifully facing a Conservation area. Enjoy a Chef's level, custom gourmet Kitchen, large beautiful Black Granite Center Island, Two Wall Ovens, Microwave Oven, Cooktop, Warming Tray, elegant cabinetry & showpiece Butlers Pantry. Open breakfast area, leads to upper deck & private landscaped views. Master Bedroom w lovely Master Bath, spacious sitting area & Walk in Closet. Plus,1st floor office/bedroom with Full bath. A finished walk-out Lower level boasts a Wine cellar, Exercise, Recreation, Media areas & Full bath. Home includes full house Generator & 3 Car Garage. Come & enjoy, all this home has to offer. Call Virginia Rea to see this home 732.809.6290, and see MLS #3485801 for All Pictures, full listing information sheet and Tour.